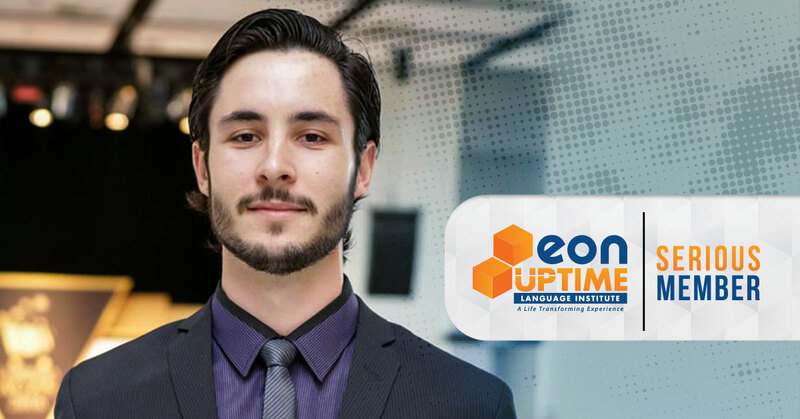 After researching information about the most famous basketball league in the world, Joaquim Oresko discovered that his greatest obstacle was with the English language, and decided to start studying at EON UPTIME. EON UPTIME’s student in the Canoas (RS) office, the journalist Joaquim Oresko shares with Blog Up his relationship to sports, the hobby that encouraged him to look for an English language institute. Seven years ago, when he decided to watch the NBA games, the contact with the English language was almost mandatory: “the NBA is the biggest basketball league in the world, and it is played in the USA and Canada”, as he explains. From 2011 to now, Joaquim graduated in college and became an EON UPTIME student. He analyzes his evolution in the language below. Oresko’s desire to be well informed about the American basketball league, the athletes and this entire universe grew with his interest about the sport. “I started to look for information right from the source: the American channels of communication, and this was when I discovered an obstacle with the English language”, he says. One year after starting college, Joaquim found a Brazilian website that wrote about the NBA games. That was when he had the idea of developing a similar content, writing just about the league. As he evolved throughout the course, Oresko felt that he needed to master the English language to achieve his goal of writing about the games. At that time he visited an EON UPTIME office, and he thought that the quick learning offered by the institute was perfect for him. However, at the time he didn’t have enough time to dedicate to the course. “I fell in love with the teaching method used by EON UPTIME, but I didn’t have enough time in my daily routine to dedicate to the course. Not even the best course in the world can teach a student who doesn’t make enough effort”. For this reason, he then decided to start studying at another institute, with a traditional methodology: longer duration and more students in the classroom. “I started studying in another institute that was not as demanding as EON UPTIME, but I gave up one year and a half later”, says Joaquim. As soon as he graduated in college he decided to restart studying English but this time, at EON UPTIME. “This time, with plenty of time available to study and evolve as the course promised. Now, four years later, I’m doing the course I dreamed of in 2014”, explains Joaquim. Although he doesn’t work with the NBA, the current press officer says that he has had his texts about the league published a few times in the Zero Hora newspaper, one of the biggest communication channels in the Southern region of Brazil. To be informed about the sport, Joaquim says that he still searches for content in English, which is a habit he believes, has contributed to his development. “Now I can watch the games with the original narration [in English], and read news in specialized American websites, with an almost perfect comprehension, and I’m still a few months from concluding the EON UPTIME course”, he says. Now that he is almost concluding the EON UPTIME course, Joaquim says he is sure that he will soon achieve his goals: “be fluent in English and work with American basketball”.